Google has copies of your data , search history, Gmail, YouTube history, and many other. You can also download a copy of this data. 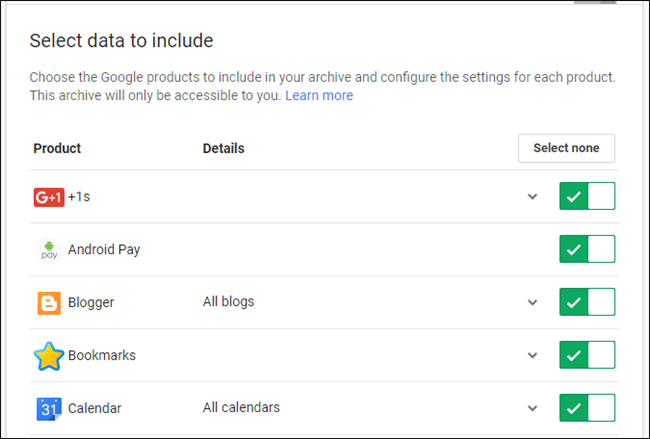 The product, called Google Takeout, is used for downloading all of your Google data across all Google services. 2.After that you'll see this page for Manage archives. 3.By default, all of the options are toggled to the “on” but there’s a button at the very top to “Select none.” If you only plan on downloading a couple of things, this is the easiest way of doing that. If you want the whole then leave it as is. 4.You’ll also notice that many of the options have a little dropdown arrow next to the on/off toggle. This is where you’ll select various options or get more information about each selection. 6.Choose what works best for you. Click the “Next” box at the bottom. 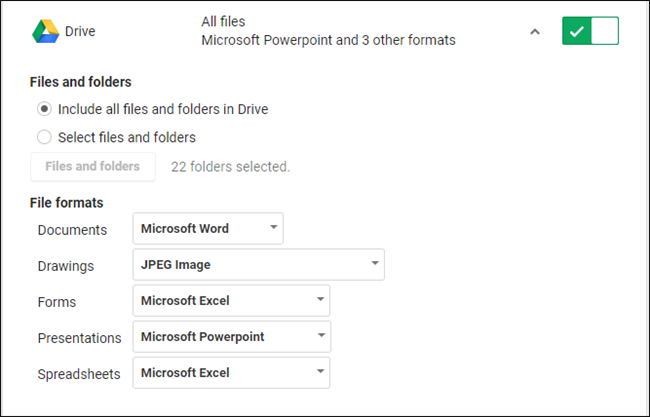 7.Now choose your file type, archive size, and how you want to get the download. 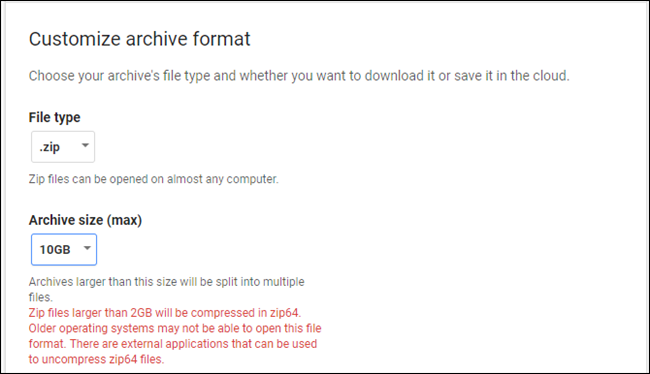 The default option is set to download the archive as a zip file with a 2GB maximum size. If you want a larger size, it will automatically be converted to zip64, which may not be supported by older operating systems. If you choose to leave it at 2GB, the archive will be broken down into as many 2GB files as necessary. 8.Get a download link by email or add the file to a specific cloud storage medium. Drive, Dropbox, and OneDrive are all supported. 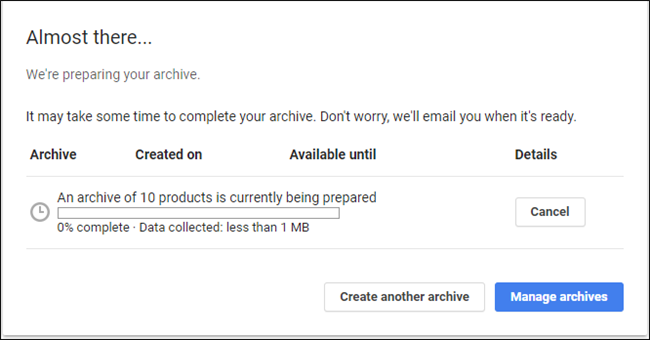 Click the “Create Archive” button. 9.Progress bar will be shown.If you’re downloading everything, it could literally take days to compile. 10.Once it’s finished, you’ll get an email letting you know. If you chose to get the download by email, a link will be here. Otherwise, you can also get to the download by heading back over to your Takeout page and selecting the “Manage Archives” button at the top. 11.Click the download button beside the option you want to pull down. Done and done. Archives are only available to download for a week, after which they’ll be removed and you’ll have to re-compile them. What Technology will be used to provide In-flight Wi-Fi? What are the Python Functions and how to create them? How to Measure Strength of Wi-Fi Signal? What should do if error 0x8007042B upgrading to Windows 10 version 1803 occurs? What are the main reason for the Emergence of Oligopoly? What is a Constructor and Destructor in C++?